It’s really kind of silly to think that, until now, none of our home coffee brewers informed us of the temperature of the water used for brewing. Doesn’t it seem slightly unbelievable that by this juncture, when we are raising coffee brewing to an artisan level, that we don’t even know this basic information? Wouldn’t you think we would want to know the temperature of the water, since it happens to be just about all of a cup of coffee, except for one and a quarter percent? Well, the wait is nearly over as the BraZen Coffee Brewer is being shipped to customers the end of the week. Will your House Blend taste different at 196, 200 or 203 degrees? If the answer is yes” we’ll be kicking ourselves for not having this idea first! Features like temperature selection (1 degree increments from 190 to 210F) and pre-soak have been reserved for professional coffee brewers, and just the higher end ones at that. The BraZen puts brewing variations in your hand, giving you the tools to tweak your brewing, and doing so in an easy to use package that looks a little space age, but classy in an interesting way. Other features include temperature glide, temperature calibration with altitude correction, ‘auto’ setting for when you want to wake up to a fresh pot, a stainless steel, water heating reservoir, and, a host of other enhancements. 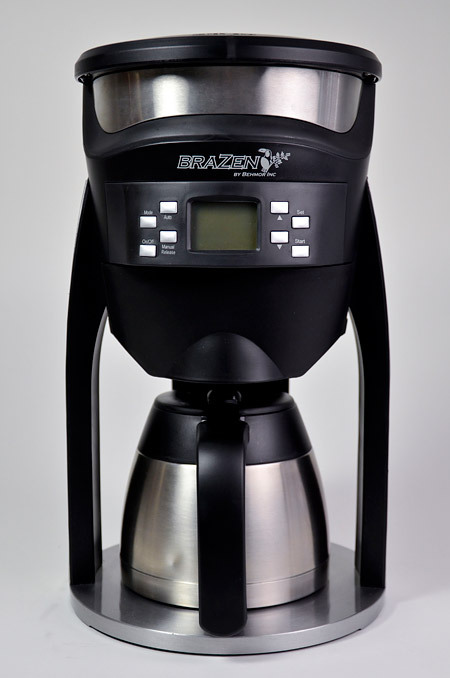 The BraZen Coffee Brewer is $199 including free shipping, a pound of coffee and more from our main site. There you will also find a more in-depth discussion of features as well as photos. As I am writing this I am in the Adirondack mountains at the home of friends, where I have brought a BraZen and a Technivorm brewer along with a pro digital thermometer. I calibrated the thermometer to 208 degrees for this altitude after a minor adjustment for barometric pressure. Altitude here is 1980 feet so I calibrated the BraZen to 2000 feet. When calibration was complete the usable temperature range became 190 to 206 degrees (attainable temperature less 2 degrees). I brewed a full pot of coffee with a target temp of 200 degrees, same as I had last done at home. When the water reached its target temperature and started brewing I measured the water temp in the reservoir using the separate digital thermometer and found it to be precisely 200, verifying that the calibration process had perfectly done its job. Separately, I brewed a pot on the Technivorm model and it was able to attain a brew temp of 197 degrees with an occasional spurt reaching 198. This is very respectable and makes sense. The target temperature range of Technivorms is 195 to 205 degrees but attempts to hold 200, so at this altitude that 200 was reduced by about 3 1/2 degrees. The BraZen is accurate to within 2 degrees but was spot on during this test. A point worth noting is that I could have cranked the Brazen brew temperature up as far as 206 degrees at this altitude, had I wanted. In that case the coffee temperature would have been about 10 degrees more than the Technivorm, or for that matter, any fixed temperature brewer. This somewhat unscientific experiment was conducted with the bewildered gaze of my friends, who wondered while the hell I came for a relaxing visit to their mountain home bearing an armada of coffee brewing and lab equipment. But, all was well as we enjoyed some fine cups of coffee each day brewed with an accurately calibrated BraZen brewer, which was making coffee in the mountains to the exact recipe as that used at our sea level home.